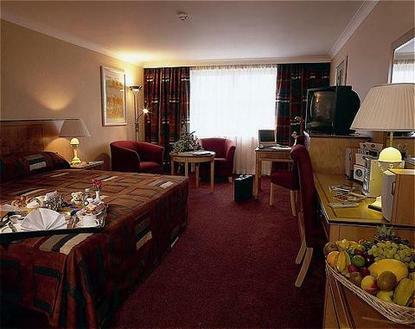 This international four star hotel is superbly located in the heart of Belfast, convenient to the business and commercial districts, and ideally positioned amongst Belfast?s entertainment and shopping areas. Next door to the famous Grand Opera House and close to the Waterfront and Odyssey Concert Venues. The hotel is a 10-minute drive from all major motorways and ferry and air terminals, with a rail link next door. Since its opening, the Europa has reigned supreme among the Capitals meeting places, and the popular city landmark has become the choice of Presidents and Prime Ministers. This cosmopolitan hotel offers spacious elegance, luxury and style, proven by the fact that the Europa was the choice of President Clinton during his visits to Belfast. The Europa has 240 bedrooms, including 56 execuetive bedrooms, making it one of the largest hotels in Northern Ireland. Each bedroom is exquisitely appointed and traditionally furnished offering guests the ultimate in comfort and style. Fine cuisine is on offer in the Superb Piano Bar Restaurant and for more informal dining, the Brasserie Restaurant serves a wide range of fayre 18 hours a day.